The protein encoded by this gene is a member of a family of actin-related proteins (ARPs) which share significant amino acid sequence identity to conventiol actins. Both actins and ARPs have an actin fold, which is an ATP-binding cleft, as a common feature. The ARPs are involved in diverse cellular processes, including vesicular transport, spindle orientation, nuclear migration and chromatin remodeling. 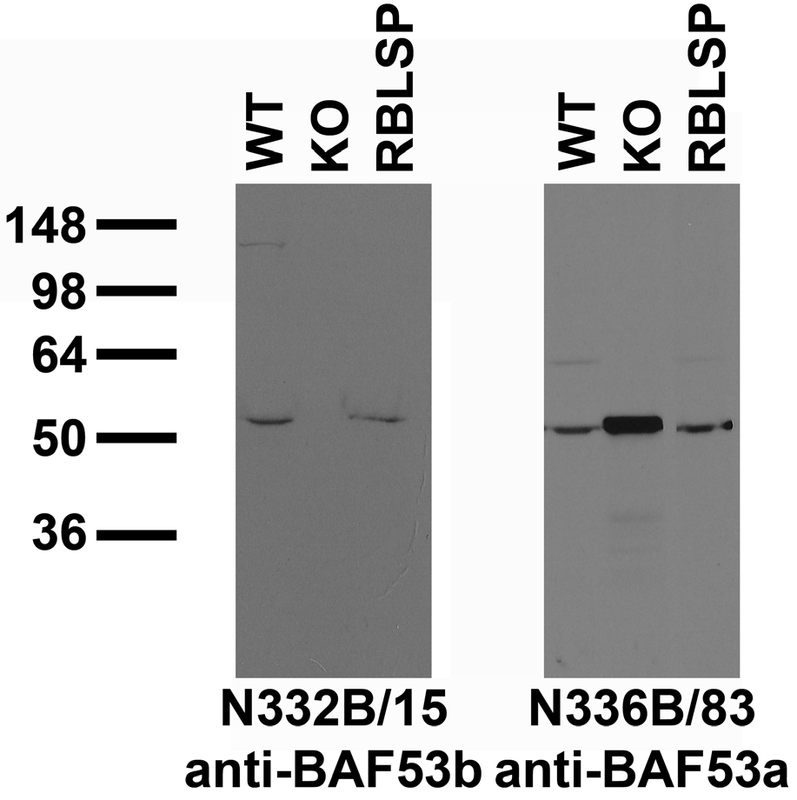 This gene encodes a subunit of the BAF (BRG1/brm-associated factor) complex in mammals, which is functiolly related to SWI/SNF complex in S. cerevisiae and Drosophila; the latter is thought to facilitate transcriptiol activation of specific genes by antagonizing chromatin-mediated transcriptiol repression. This subunit may be involved in the regulation of genes by structural modulation of their chromatin, specifically in the brain. [provided by RefSeq, Jul 2008]. 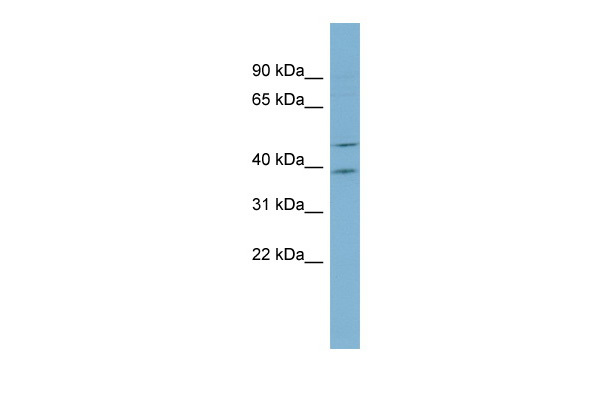 Nuclear extracts of HeLa cells ( 40 µg ) were analysed by Western blot using ACTL6B polyclonal antibody ( Cat # PAB14085 ) diluted 1 : 1,000 in TBS-Tween containing 5% skimmed milk. 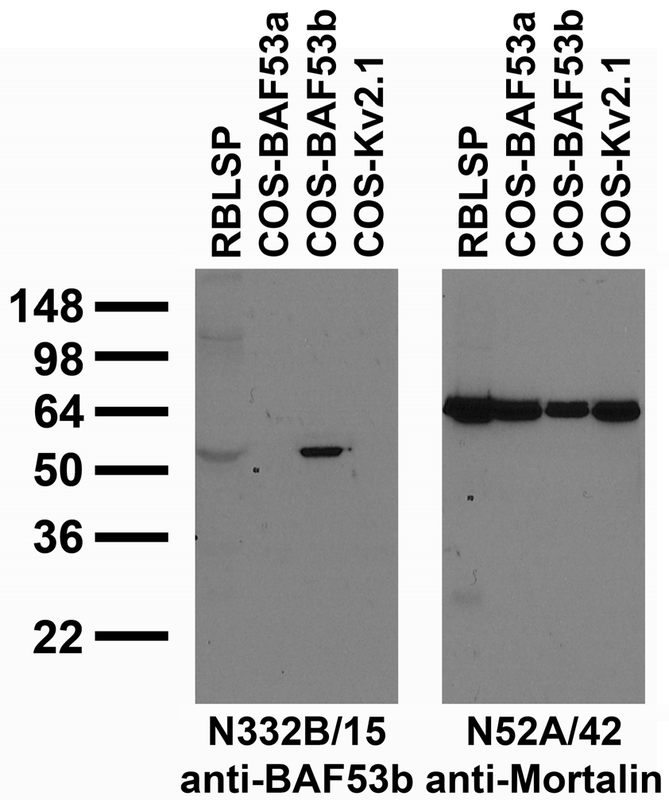 ELISA was performed using a serial dilution of ACTL6B polyclonal antibody ( Cat # PAB14085 ).The plates were coated with the peptide used for immunization of the rabbit.By plotting the absorbance against the antibody dilution, the titer of the crude serum was estimated to be 1 : 76,000.
tissue and transfected cell immunoblot: extracts of rat brain low speed pellet (RBLSP) and COS cells transiently transfected with untagged BAF53a, BAF53b or Kv2.1 plasmids and probed with N332B/15 (left) and N52A/42 (right) TC supe. 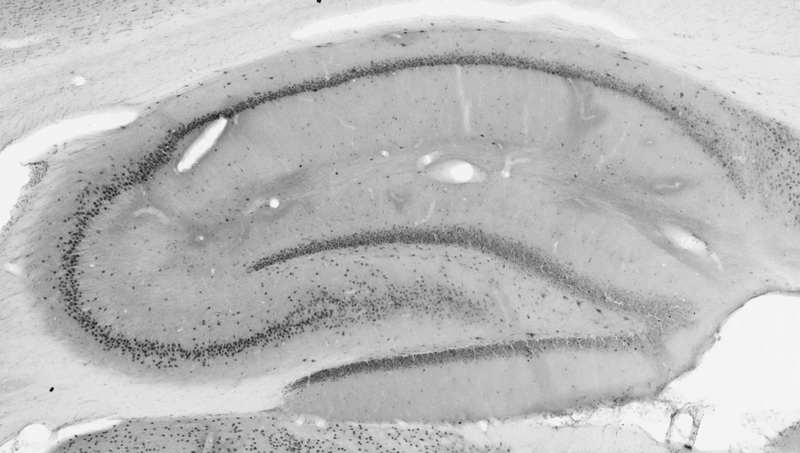 Immunoblot versus samples from adult rat brain (RBLSP) and WT and BAF53b KO mouse brains probed with N332B/15 (left) and N336B/83 (right) TC supes. Mouse samples courtesy of Ann Kuo and Gerald Crabtree (Stanford). 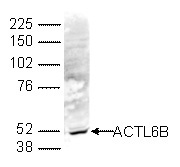 WB using the antibody against ACTL6B diluted 1:1,000 in TBS-Tween containing 5% skimmed milk. The position of the protein of interest (expected size: 47 kDa) is indicated on the right; the marker (in kDa) is shown on the left. Determination of the titer To determine the titer, an ELISA was performed using a serial dilution of the antibody against ACTL6B. The plates were coated with the peptide used for immunization of the rabbit. 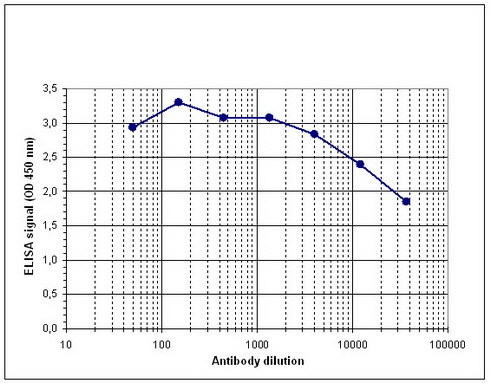 By plotting the absorbance against the antibody dilution (Figure 1), the titer of the antibody was estimated to be 1:76,000. 11 products - FILTER YOUR RESULTS!